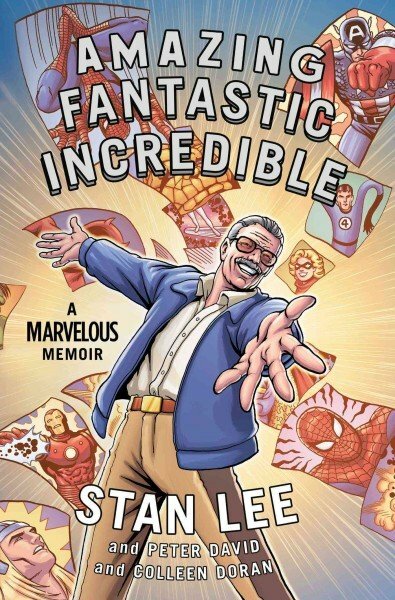 "Amazing Fantastic Incredible: A Marvelous Memoir" by Stan Lee, Peter David and Colleen Doran, Hardcover. Stan Lee is a legend. Along with artists Jack Kirby and Steve Ditko, Lee helped populate the Marvel Comics universe with heroes like the Fantastic Four, the Incredible Hulk and Iron Man. Their most famous creation — Lee calls him "Spidey" — is everywhere in this office, as a painting, a life-size doll, and even a pinball machine. "Nobody plays pinballs anymore," Lee tells NPR&apos;s Renee Montagne. "And it&apos;s really a good thing, because it doesn&apos;t work anymore." The man who dreamed up lots of backstories for Marvel characters has now put out his own origin story: A memoir, Amazing Fantastic Incredible, in comic book form. It begins with Lee as a boy, transported to other worlds through books by Arthur Conan Doyle, H.G. Wells and William Shakespeare. His real world was the Depression, a father mostly out of work and a dingy New York apartment with laundry hanging in the kitchen and a brick wall for a view. Lee says his mother doted on him; he remembers she&apos;d just watch him read. "One of the best gifts I ever got — she bought me a little stand that I could keep on the table while I was eating, and I could put a book in the stand, and I could read while I was eating. I mean, I always had to be reading something," he recalls. I realized that people had no respect for comic books at all. Most parents didn&apos;t want their children to read comics. And I was a little embarrassed to be doing the work I did, and I figured someday I&apos;ll write the Great American Novel and I don&apos;t want to ruin my possibilities by having my name disliked this way. And I became Stan Lee. The stories in the comic books then were a little bit different. My publisher was typical of all the publishers, and in the early days he would say to me, "Just give me action! I want a lot of action in every panel! That&apos;s what the kids want." So I wanted the characters to have good personalities, I wanted provocative situations — I don&apos;t think he knew what the word provocative meant. Aside from the fights, there was nothing much to recommend the books. I was really ready to quit. I was getting sick of doing these one-character-punches-another and says, "Take that, you rat." So my wife said to me, "You want to quit. Before you do, why don&apos;t you get one story out of your system? Do one the way you want to do it. The worst that will happen, he&apos;ll fire you. But you want to quit anyway. So what have you got to lose?" So that&apos;s when I did the Fantastic Four. Jack made him look very heroic and strong. But that isn&apos;t the way I wanted him. I wanted him to look like a typical, thin high school kid. And he doesn&apos;t get all the girls because of his athletic prowess. He&apos;s just kind of a shy high school kid who&apos;s a science major. It was no big deal. I said, "Jack, forget it. I&apos;ll give it to someone else." And he was busy with a dozen other books. He didn&apos;t care. So I called Steve Ditko, and Steve gave him just the right look. And that&apos;s how Spidey was born. Not really. I love those characters I&apos;ve done. But I&apos;ve moved on to other things. I love talking about them, I love people being interested in them. And I&apos;m interested in them too. But as I say, they&apos;re things that I had written. I&apos;m glad they turned out to be successful. But today is another day.